Perhaps the day is coming soon when dealership service drive personnel or rental fleet staffs already will have a host of information about a vehicle’s tire condition and other data points before the customer even gets in line. Revvo, a Silicon Valley-based startup formerly known as IntelliTire that offers an internet of things (IoT) “smart” sensor for vehicle tires, announced on Tuesday that it has raised $4 million in Series A funding. Norwest Venture Partners led the round with participation from Vulcan Capital and AngelList, according to a news release. Revvo said it will use the financing to continue to build the product and expand its technical and business development teams. Revvo highlighted that the firm proudly joins the ecosystem of tech startups fueling the shift in the mobility and transportation sectors. Although autonomous vehicle and self-driving technology have made enormous advances, Revvo contends the tire has remained virtually unchanged, despite being one of the most critical components of a vehicle’s performance, safety and reliability. The firm sees the market offering a massive opportunity with more than $225 billion spent on 2.2 billion tires in the last year alone. Revvo’s initial focus will be on the fleet sector, a segment consuming tires at a disproportionately high rate with clear pain points around tire usage. Revvo explained that it has built what the company said is a first-of-its-kind, sensor-enabled artificial intelligence software platform to monitor tires while a vehicle is on the road. The technology includes proprietary sensors that are embedded inside the tire, which can generate a real-time feed of a tire’s condition and performance. The sensors capture thousands of data points per second from the interior of the tire which is sent to the cloud via an app on the driver’s phone. Artificial intelligence and machine learning models are applied to the aggregated data set to better predict tire tread wear. This technology can helps the driver and fleet managers better understand the overall health of the tires on their vehicles which leads to increased vehicle uptimes, optimized efficiency, and improved safety. “Until now, tires have not benefited from the mobility revolution. Through machine learning and AI, tires can provide an invaluable data set of road conditions, driver behavior, and feedback for vehicle performance,” Revvo chief executive officer Sunjay Dodani said. Parker Barrile, who is a partner at Norwest Venture Partners, added, “We live in a world of increasingly connected and autonomous vehicles, but tires haven’t changed in decades. “We’re excited to work with the team at Revvo to make tires as smart as the vehicles that depend on them and to tap into a massive market that is shifting toward fleets and autonomous vehicles,” Barrile went on to say. For more information, visit www.revvo.ai. The company also announced that telecommunications veterans Paget Alves and Dennis Huber will join its board of directors. Alves and Huber have a combined 50-plus years of experience in telecommunications, finance, operations, marketing, product development, and IT. Along with an enhanced partnership with General Motors, Enterprise Holdings this week announced the promotion of Christine Taylor to president and chief operating officer and the promotion of Carolyn Kindle Betz to president of the Enterprise Holdings Foundation. 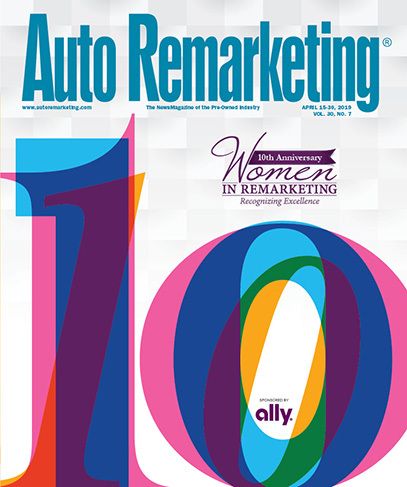 The move makes both senior executives among the highest-ranking women in the car rental, automotive and travel industries, while marking another milestone for the rising third generation of family ownership of the company, which owns the Enterprise Rent-A-Car, National Car Rental and Alamo Rent A Car brands. “It’s fitting that these two talented women — granddaughters of our company’s founder, Jack Taylor — are moving up together as members of our senior leadership team,” said the company’s chief executive officer Pam Nicholson. “Under Chrissy’s guidance, Enterprise has continued year after year to deliver record-breaking growth and business performance, while staying true to the values of customer service and workplace excellence that Jack instilled in our company,” Nicholson continued. “Concurrently, Carolyn has continued to play a key role in developing our philanthropic strategies and ensuring that we are an engaged and responsible corporate citizen in the communities where we do business,” Nicholson went on to say. Taylor previously was the company’s executive vice president and chief operating officer, a position she assumed in 2016. In her new role, Taylor will direct the company’s global business operations and oversee its product development and technology innovation efforts, with a special emphasis on ensuring that any new technology the company deploys supports its commitment to deliver a superior customer experience. Taylor will continue to serve as a member of the corporate board of Enterprise Holdings and will report to Nicholson. Kindle Betz previously was senior vice president and executive director of the Enterprise Holdings Foundation, which contributed more than $50 million in charitable gifts to a wide variety of nonprofit causes in the company’s most recent fiscal year. As president, she will develop and oversee execution of the foundation’s philanthropic strategies. In addition, Kindle Betz plays an active role in several community organizations at Enterprise’s world headquarters in St. Louis. Most recently, she assumed leadership of the ownership group that seeks to bring an MLS soccer team to St. Louis – the first such group in MLS history to be majority-owned by women. Kindle Betz also will continue to serve on the company’s corporate board. The current President, Jo Ann Taylor Kindle, will now assume the role of chairwoman. “These are both enthusiastic, energetic leaders,” Nicholson said. “When you look at Chrissy’s competitive drive and passion for innovation and Carolyn’s strong commitment to help our company make a difference in the world, you see the brand of leadership that will take Enterprise to the next level. “And you see, as well, living proof that strong family ownership is a powerful competitive edge. Enterprise’s future is in very good hands,” Nicholson went on to say. Their grandfather founded the company in 1957 with only seven vehicles, later naming it after the World War II aircraft carrier he served on, the USS Enterprise. Today, with annual revenues of $24.1 billion and 100,000 employees, Enterprise Holdings and its affiliates own 2 million cars and trucks and operates — through an international network of regional subsidiaries and independent franchises — more than 10,000 fully staffed neighborhood and airport locations in more than 90 countries throughout the world. In other company news, Enterprise Holdings announced a partnership with General Motors to significantly increase the number of connected vehicles in its fleet by the end of 2019. Enterprise began piloting its connectivity platform with GM this year, with a goal of adding more than 100,000 connected Chevrolet, Buick, GMC and Cadillac vehicles to the fleet during the next 12 months. The company highlighted this initiative will streamline and enhance the experience for customers of the Enterprise Rent-A-Car, National Car Rental and Alamo Rent A Car brands. The company indicated connected vehicles will soon expedite the renting and returning of vehicles for customers at neighborhood and airport Enterprise, National and Alamo locations. For example, they can automate such tasks as checking fuel levels, vehicle condition and odometer readings. Onboard telemetry can allow geofenced rental locations to automatically receive these readings when customers return their cars, making the return of the vehicle frictionless. “Connected vehicles provide customers with a simple, fast rental and return experience,” Taylor said. “The potential for the products and services we’ll be able to offer our customers when all of our vehicles are connected is limitless. “As we add these cars to our fleet, we look forward to introducing customers to new technologies and features that not only enhance the driving experience, but also the entire transportation ecosystem,” Taylor added. Beyond the benefits to future rental experiences, car rental customers can take advantage of the many features and services available via the embedded connectivity in GM’s connected vehicles. The vehicles will come with the latest technology for personalized driving experiences, including Apple CarPlay, Android Auto and OnStar. Such features as emergency services, crisis assistance, automatic crash response, and remote lock/unlock will also be included to add an additional level of convenience and safety. When Enterprise completes the transition to connected vehicles, the company said it will own the largest fleet of connected vehicles in the world. Hertz is looking to make a safe bet on autonomous vehicles in Sin City. Coming on the heels of the rental car company hiring a new chief information officer, Hertz and its fleet management subsidiary, Donlen, on Tuesday announced a new strategic partnership with Aptiv, a global technology company enabling the future of mobility. Hertz said it will assist with the operations and management of Aptiv's Las Vegas autonomous vehicles (AVs). The company highlighted Aptiv’s technology powers what are deemed to be safe and reliable AVs in cities worldwide with Las Vegas serving as the initial North American commercial deployment market. The two companies will execute a phased approach to develop standard operating procedures for mobility-related AV fleets. The initial program, scheduled to launch this fall, will further enhance and guide the implementation of similar programs in future markets. “Our partnership with Hertz will allow us to operate and maintain autonomous fleets at scale — a critical element of the offering that our on-demand mobility customers will require,” said Glen De Vos, Aptiv’s chief technology officer and president of its mobility and services group. “This relationship is an important step in the broader journey for Aptiv, within the self-driving technology space,” De Vos continued. Michael Fisher, senior vice president and chief digitization officer of Hertz, emphasized that the company is committed to emerging mobility and actively supporting fleet management partnerships. “Hertz continues to innovate and execute winning strategies in the evolving mobility landscape. We’re pleased to announce this partnership with Aptiv, a leader in the development of autonomous driving technology,” Fisher continued. “This allows us to build on our expanding platform for managing AVs of the future while we leverage our expansive expertise and network managing our existing car rental and commercial fleets of more than 1 million vehicles,” he went on to say. Toyota is saying aloha in Hawaii in a new way. Whether it’s jaunt to the beach, a quick errand or the drive to work, the automaker highlighted these activities just became more manageable for residents of Honolulu and visitors alike with the recent launch of a creative new mobility solution called Hui – a round-trip, station-based car share service. Operated by Servco Pacific, Toyota’s distributor in Hawaii, the Hui service utilizes Toyota’s proprietary global mobility service platform (MSPF) and a consumer facing app developed by Toyota Connected North America (TCNA), the global technology strategy business unit for Toyota. A total of 70 Toyota and Lexus vehicles are available for reservation through the Hui mobile app (for iOS and Android devices) by the hour or day at 25 easily accessible locations throughout Honolulu. The vehicles initially in the program include the Toyota Prius, Prius Prime and Camry XSE, as well as the Lexus RX 350 and RX F Sport vehicles. Hui vehicles are parked in marked, reserved stalls for easy pick-up and drop-off. The app supports a range of fleet management tools, as well as driver identification, authentication and payment management. In addition, Hui vehicles are equipped with Toyota’s Smart Key Box, which generates a digital key that allows users to lock and unlock, as well as start vehicles via their smartphone. “We’re really excited about Hui because it’s a game changing way to offer car sharing,” said Zack Hicks, chief executive officer and president of TCNA, and chief digital officer of Toyota Motor North America. TCNA and Servco developed the service together as one of the first public applications of MSPF, the core ecosystem for leveraging the potential of connected vehicle systems to support the development of new mobility businesses — such as car-sharing, ride-sharing and remote delivery. The platform can give fleet operators the capability to launch their own car share programs, capitalizing on the strength of their local expertise, while supporting leading-edge mobility use cases as they arise. For more information on pricing, station locations and terms of service, visit www.drivehui.com. In several European markets where FCA does not operate its own captive arm, LeasePlan will now offer operational lease solutions to FCA customers. The vehicle leasing and fleet management provider announced Monday that it has agreed to be a new FCA operational lease partner that will concentrate on the growing small and medium enterprise (SME) segment of car buyers. FCA SME customers in Austria, Czech Republic, Denmark, Finland, Greece, Hungary, Norway, Poland, Portugal, Slovakia, Sweden and Switzerland can now take advantage of full operational lease products that are available on a preferred partner basis from LeasePlan. LeasePlan said it defines SME customers as those with up to 25 vehicles in their fleet. “SME is LeasePlan's fastest-growing segment and a crucial element in our strategy to lead the European Car-as-a-Service market,” LeasePlan senior vice president commercial Berno Kleinherenbrink said in a news release. “I'm therefore delighted to announce our new partnership with FCA, which gives us an additional route to serve the important SME segment. “These customers want flexible, hassle-free and fast solutions — and that's exactly what we provide,” Kleinherenbrink continued. At year-end last year, SME vehicles made up about 17 percent of LeasePlan's serviced fleet, according to the company. In contrast to traditional white label agreements, LeasePlan explained that its new partnership with FCA is based on a referral model where the automaker will provide vehicles with an operational lease managed fully by LeasePlan. The partnership aims to deliver customers flexible, cost-effective solutions in a short amount of time, according to LeasePlan. “This is the first partnership of its kind for LeasePlan with a major European OEM,” the company said. With pre-configured FCA vehicles available, LeasePlan said customers can receive the vehicles they select within two weeks. Additionally, LeasePlan said that it will extend both training and certification to FCA dealers on its SME products and service portfolio. Runzheimer, a business vehicle technology and solutions provider, combed through more than a half dozen sources — including Manheim, Edmunds, IHS Markit and the National Automobile Dealers Association — to compile its Vehicle Capital Costs Trend Report. Firm analysts cautioned fleet managers and other auxiliary service providers that new-vehicle prices in the U.S. have risen steadily since 2012 and potentially that trend could continue in 2018, citing their comprehensive data review suggesting that this will be the case. • The overall average price of a new vehicle will increase moderately over the next 12 months by 1 percent to 2 percent. • As inventory in the used vehicle market steadily increases, residual values will decrease over the next 12 months by 2 percent to 3.5 percent. • Depreciation is expected to increase 1 percent to 1.5 percent. The entire Runzheimer report can be found here.